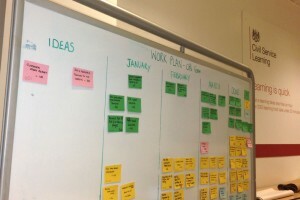 As well as being the default approach for designing user-focused public services, Agile working methods can help Whitehall teams work more efficiently. We wanted to share one of the ways in which the Operations Team in Civil Service Learning is using more Agile techniques and, as a result, is planning more effectively as a team,and creating a strong sense of shared purpose. Until recently, teams worked in their own silos and didn’t always get the opportunity to comment on each others’ projects or draw on their expertise. This, coupled with the fact that business planning was a laborious process, didn’t leave us in the best position to work effectively or collaboratively. The task sounded simple enough - come up with an easy way to plan and prioritise our projects on the go, while working better as a team. Completing the task took us through 3 different iterations of planning and monitoring our workload. 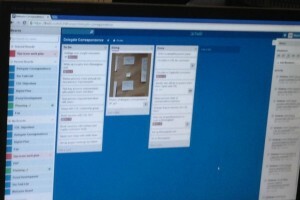 We started by using a work-plan in a shared drive, moved on to a physical board in our office, and finally to an online board using the Trello project management app. We know the first work-plan wasn’t the most effective - it was hard to update and ended up being more of a tick-box exercise. So, the challenge was to build a plan that people could update easily and that was visually appealing, so that everyone could see the changes and be aware of important developments. The second solution - a physical board in the office - worked really well. It comprised a few columns, showing projects in the ideas stage (that anyone could contribute to); projects that were ‘parked’; and a timeline showing the projects scheduled for the next 6 months. We used our weekly meeting slot to review the plan, identifying new ideas worthy of making it on to the plan, the projects that had slipped and their impact, and celebrating successes - something never to be overlooked! However, as our team operates a flexible working policy we are rarely all in the office at the same time, and the plan wasn’t available to everyone. So, we moved on to the third option. A few colleagues were already using Trello to create ‘to-do lists’ within their own teams and starting to see real benefits. We thought this would be a great vehicle for the plan, as you don’t need everyone to be in the office at the same time, it can be monitored easily and remotely, and is very visual. Because it’s important for us to encourage collaboration across the organisation, we have also kept the physical board, which sits by our tea point, so people can’t miss it! I would definitely encourage everyone to think about being more Agile and open to new ways of working. By adopting just 1 Agile technique, our team has increased its digital skills, created a shared purpose, and now monitors projects in a more efficient and effective way - and we’ve had fun along the way. Anyone responsible for good work can now expect to be awarded a sticker of Taco (Trello’s Husky dog mascot) - what’s not to like! I found this article really interesting but I'm intrigued as to why we are using two different approaches to planning. Within HMRC pacesetter is used but I have noticed I am hearing more about agile? In a age where movement within departments is easier - would it be more efficient to use one way of working? We're just starting down this road too. I think a visual aid like this really helps to get people on board and supporting each other. I tried to access the Trello link but was denied access. Is this expected? You also need to use an up-to-date browser (notg IE8 for example), otherwise Trello won't work. Another barrier for government departments and agencies to use good, free tools. 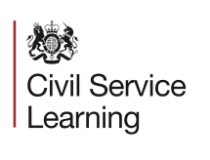 The Civil Service does NOT use Agile - it pretends to use a bit of Scrum for development but the Agile methodology is obvious by its absence - have you ever seen any burn-down charts? The cause, as usual, is GDS who understand little but their own slogans, as they have no delivery experience.